What Are Power Washer Extension Wand? Clean grime from far to reach pipes outside the house. Clean from below automobiles where it is not easy to reach with hand. Easily clean from below the mud guard of your car. Clean grime gathered on the ground outside or between the tiles. Affordability: Extension wands are a very affordable attachment for your pressure pumps. 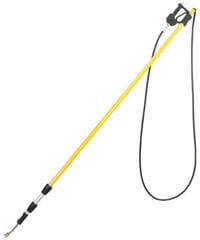 Power washer extension wand is available from as low as $20. Grip: The wand is insulated with a strong gripping material that is non-slip. So that you can easily grip the handle without the fear of it slipping from your hands. Rust Proof: The extension hands are made from stainless steel or chrome so that they are rust and corrosion proof. This is extremely important because the wand is always humid. Light Weight: Extension wands are extremely light weight which makes them perfect to reach far off places without even tiring your hand. Variety: These wands come in a number of shapes and sizes. They are also available to support different pressure and outflow of the water. High Temperature: Extension wands release high temperature water at a high pressure. Maintain Pressure: These wands can maintain or increase the pressure that is required. Compatibility: Simply fit the wand on any pressure washer that you have. They are highly compatible. From as short as 39 inches they can be up to 79 inches long. They can allow water temperatures up to 300 F to flow through them. Different nozzles can be connected to the extension wands. Extension wands also come in the form of dual lances. These are best to use when both high and low pressures are needed. This one nozzle can be used to spray chemicals and the other can be used for water. There are a number of accessories available for use with extension wands. There are wand assistants that come with a small wheel, that keep the extension wand at the required distance from the ground. You can simply glide the wand without requiring much effort. There are also wand holders available in the market, which are best for storing wands. Check out our power washer accessories for more! Choose the best equipment for your needs. Tips and pressure washing cleaning solutions for cleaning bricks.